These past few months have been a meditation of sorts – on the meaning of life not on the grand scale but on the minutiae of everyday living, mine; and on the impact this life has on those around me. We live in relationship to each other after all, whether we acknowledge it or not. Essential to this meditation is the act of meditation, the formal practice, as well as the mindful approach to every moment. Both of which I had neglected. Resuming these practices began with being “idle” instead of the more acceptable dynamism of “saying yes” to every opportunity. Surrendering to passivity and giving space, then choosing to be actively passive is quite a lesson, as thoughts swirl and self-judgment abounds…being aware of the process of this idleness, of choice, and of the unceasing thinking that follows. Allowing for feelings to simmer for a while, for thoughts and ideas to consolidate; giving time for unconscious forces to surface, for emotions to settle or solidify. A time of reckoning of the spirit, if you would call it that. It’s also rediscovering the lesson on self-love – when how I am is more important than how you’d think I would be, when who I am is more important than who you think I may be and to whom I ought to give, when what I give to myself is more important than what I hope to get from you. And the ‘you’ is metaphorical, if you are wondering, representing those other than ‘I’. Ironic, this identification of otherness even as I contemplate relationship or communality. It is still a surprise to me to be reminded that how I love is more impactful than what I do. It is humbling to be reminded that I still need reminders – of who and what I am capable of. Sometimes the noise can be deafening, sometimes I forget. 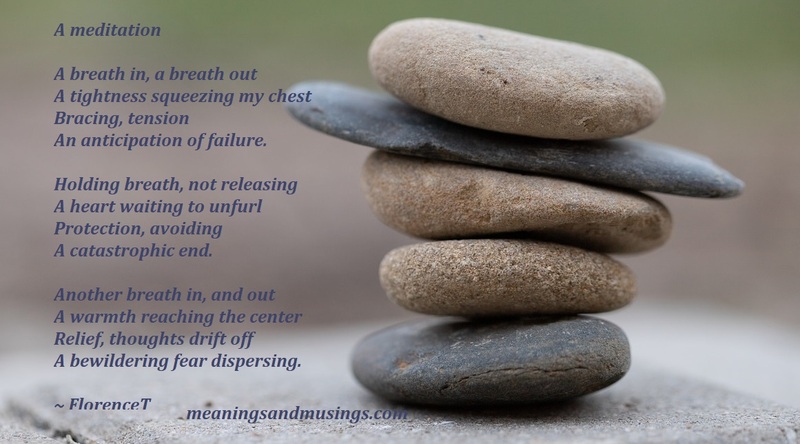 And here is a poem that arrived with the formal practice of meditation… perhaps it resonates with you? © 2019 FlorenceT Copyright reserved. The author asserts her moral and legal rights over this work.